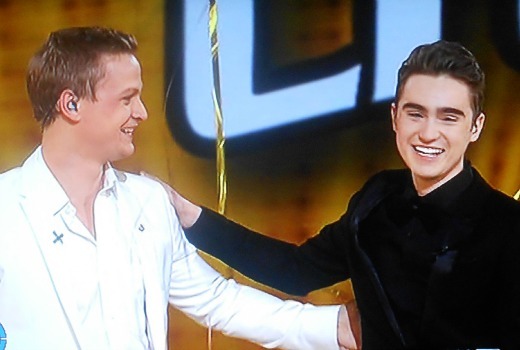 18 year old Melbourne crooner Harrison Craig has won The Voice 2013 for Team Seal. He won the title over runner-up 30 year old Luke Kennedy and wins a recording contract with Universal Music. 19 year old Celia Pavey was third and 30 year old Danny Ross was fourth in the Nine series. Craig was always the favourite to win the series after his story of overcoming a stutter struck a chord with viewers, backed up with plenty of crowd-pleasing ballads. “The past few months have been an experience like no other. This show, through Seal and the other artists, has given me so much and provided an amazing launch pad into my career,” he said. Nine’s grand final included duets between the four finalists and their coaches (although Danny Ross and Joel Madden was an aimless waffle), guests Robin Thicke and OneRepublic plus dynamic performances from Delta Goodrem and Ricky Martin. But Twitter lit up with questions about lip-syncing for La Vida Ricky. Nine has assured he sang live (and in truth even his spoken words did not sync live). The finale was a long affair, with host Darren McMullen constantly telling us “not long to go before we announce the winner” but one that is sure to top the ratings. Nine also strategically unveiled new promos for its upcoming slate including Big Brother, Australia’s Got Talent, The Great Australian Bake-off , Hamish and Andy’s Asia Gap Year and Underbelly: Squizzy. Nine is already calling for applicants for its 2014 series but it isn’t clear which coaches will feature in the third season. David: I agree. What I was trying to say was that it seemed to be the pre-recorded “live” performances that were having the sound and vision issues. And also just wanted to know if you knew if the show itself was “live”…. Or “live to air”. Yawns , rubs eyes, next wannbe thx. JM: The broadcast version was out in both vocal and speech for Ricky during his song, but both in sync online. This demonstrates it was a playout problem all along. because their generation believe piracy is stealing (not that i think its not *cough*) Why do you think people like Andre Rieu & Susan Boyle have become best sellers?